Precipitate Commences Exploration w | Precipitate Gold Corp.
Vancouver, B.C. – February 13, 2019 - Precipitate Gold Corp. (the “Company” or “Precipitate”) (TSXV: PRG) is pleased to announce it has commenced exploration at the Lithocap Zone within the Company’s 100% owned Pueblo Grande project within the Pueblo Viejo Mining Camp in the Dominican Republic. 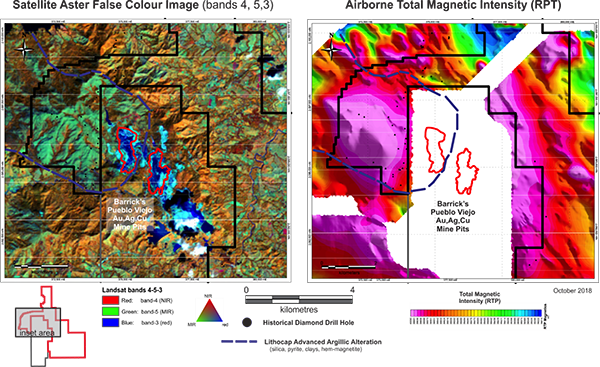 The Company has initiated exploration programs on its priority Lithocap Zone located three kilometres west of Barrick’s world-class Pueblo Viejo gold-silver mine. Near term work to be completed by the Company’s field crews will include the collection of over 1,100 individual soil samples from within the Lithocap Zone to facilitate greater surface sample density and a more comprehensive geochemical database from within the priority target area. In addition, crews will begin preparation for a ground magnetic geophysical survey expected to focus primarily within the Lithocap Zone. 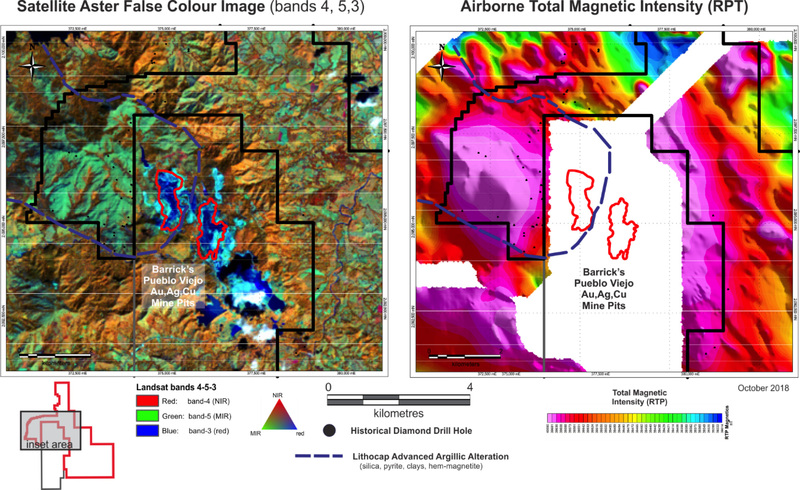 Field work is focusing on the portion of the regionally extensive high-level advanced argillic Lithocap alteration which coincides with a notable geophysical magnetic high; a target area measuring approximately 2.5 km by 3.0 km which has seen little past systematic exploration (see accompanying image or the Company’s website for more details www.precipitategold.com). The Lithocap Zone, west of the Pueblo Viejo mine, is interpreted to be a high-level advanced argillic lithocap alteration type environment which lacks significant known surface gold-silver mineralization but has an anomalous trace element suite that typifies the adjacent Pueblo Viejo mineralization style. The lithocap alteration is dominated by pervasive quartz-pyrophyllite-pyrite with numerous and widespread irregular pods, veins, and veinlets of massive hematitized magnetite. 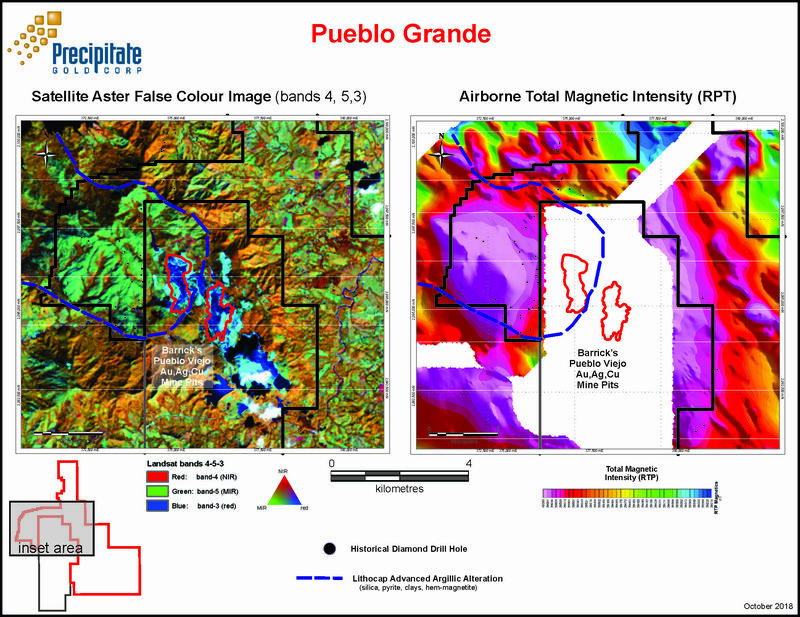 Magnetite/hematite, silicification and various pathfinder elements associated with Pueblo Viejo style high sulphidation epithermal gold-silver-copper mineralization offer key exploration vectors into and through the extensive altered Lithocap Zone.